Until I saw Tosca at Boston Lyric Opera at the Cutler Majestic on Friday night, I had never concentrated on its dialogue. Again and again this listener had surprising revelations, thanks to the BLO’s surtitles. They made a real difference in how I understood an opera I must have heard a hundred times. In this era, one should put aside one’s recollections of legendary singers, particularly Maria Callas and Placido Domingo. And then, who can forget the long-ago BSO concert version of Tosca with Sherill Milnes, whose compelling Scarpia frightened us half to death. 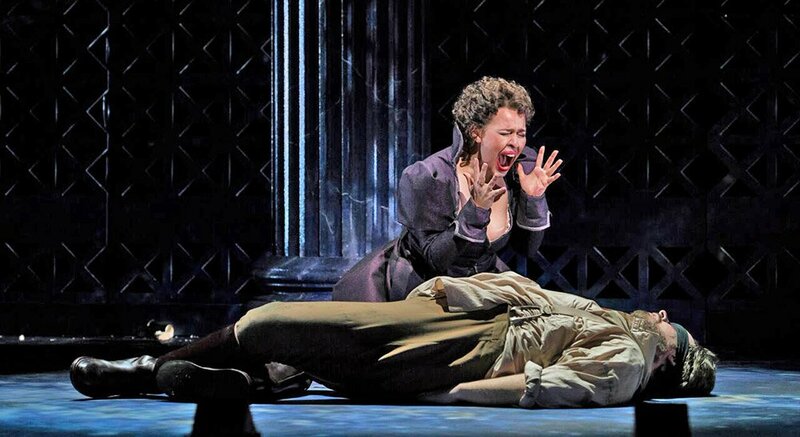 Even with these images in the grey matter, Boston Lyric Opera’s Tosca had many things to commend it. Thus, the 58-member orchestra sat on a sturdy platform ten feet above the action, behind a scrim, which, in the last act, becomes a vista of St. Peter’s and the Vatican. All one could see, at this level, was the conductor, David Stern, who was seriously splendid. The orchestra sounded absolutely wonderful; special kudos to my esteemed colleague, harpist Ina Zdorovetchi whose every note spoke beautifully. 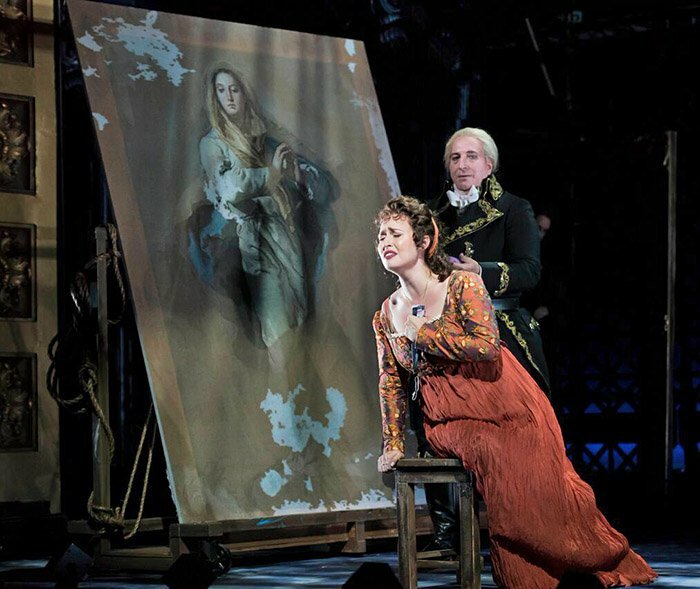 (Like other Puccini operas, Tosca is a joy for a harpist. He understood the instrument, and wrote idiomatically for it, making sure every note counted). Stern took the music a hair faster than I was accustomed to, and I liked the results. I was very impressed with his conducting. The libretto by Giuseppe Giacosa and Luigi Illica after the play La Tosca by Victorien Sardou, inspired Puccini to deliver a roller coaster of emotions; one never tires of the gorgeous instrumental and haunting vocal music. Floria Tosca, one of Puccini’s many tragic heroines-in-love, morphs from a petty, jealous, insecure, pious naif in love with the painter, Mario Cavaradossi, into a fearless, cunning woman who stabs to death her lover’s jailer, Baron Scarpia, with a knife with which he had just peeled an apple. (Oddly, the glossy program book leaves the grisly incident unmentioned, although it is perhaps the opera’s dramatic high point). Paul Hackenmueller’s lighting contributed immensely to the drama. But the success of any Tosca comes from dramatic singing and acting, and in many ways, all three principal singers succeeded. Maria Callas pretty much owned the role for decades, and, of course, Leontyne Price, Jessye Norman, and a trove of famed Italian-born sopranos helped form my image of the character. The Russian Soprano Elena Stikhina, making her American debut, is a beauty endowed with a beautiful voice and real acting ability. What I admired most were her graceful movements, and her totally credible erotically charged embraces and long, passionate kisses with Cavaradossi. She was completely convincing in the role, and while hers is not the biggest voice I’ve heard in this role, it was especially lovely in the many tender moments with her lover. Fetching gowns in peach, red, and purple were lovely matched her hair ornaments, including a tiara. (Kudos to costume designer Deborah Newhall). One hopes to hear Stikhina again, soon. Tenor Jonathan Burton, made an excellent BLO debut as Cavaradossi. After his torture at the hands of Scarpia’s thugs, his body movements (and bloody shirt and face) reflected each blow. The wonderful James Maddalena who sang the role of the sacristan in Act I, and the escaped prisoner Angelotti, sung by David Cushing also made fine impressions. Shortly before his supposedly mock execution, the doomed Cavaradossi sings the stunning “E lucivan le stelle,” lamenting the vanishing of his dream of love. A trip to Boston Lyric Opera is worth it for this aria alone. When Tosca finds him dead and Scarpia’s thugs in pursuit, she usually jumps from the parapet. This production, sadly, took a film noir twist. Tosca here just happens to find a gun, shoots herself, and drops on top of her lover. My companion felt cheated, believing the whole plot leads to her inevitable Puccinian leap. Imagine if Thelma and Louise had pulled off at the cliff and shot themselves. Beyond this lament, Boston Lyric Opera gave us a most enjoyable evening. Another bravo to all in the orchestra! The production of Tosca was musically beautiful and well-paced. I too felt cheated that Tosca didn’t jump to her death. More than that, Tosca doesn’t leave Scarpia lying on the table. She wouldn’t; it’s not true to the ceremonial Catholicism of the character. It is a commentary on today’s Weinstein scandal. There is something going on with Tosca. The jump is never enough anymore. I’m in Nashville, and here they had her shoot Spoletta in the face before she leaps. In 2010 the BLO went to great lengths to make the production more graphic. It is frustrating because we live in an age of zombies on primetime TV-there is no way that an opera can become graphic enough to compete. Sometimes I wish they would leave well enough alone. I’m seeing Burke/Hare on Thursday 8. November; I shudder to think what I’ll see.